Looking for an alternative to honey baked ham? Impress your family and friends with a juicy baked ham set off by a distinct glaze made from crushed gingersnaps, apricot jam and spicy brown mustard. 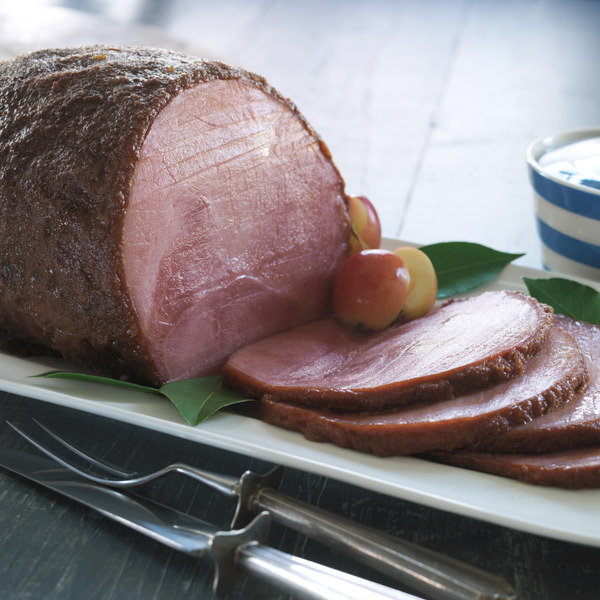 This easy ham recipe serves a crowd, making it perfect for holiday gatherings or potluck dinners. Or try it to add a little spice to your winter weeknight meals—the leftovers are great for lunch the next day. Preheat oven to 350°F. Place ham on rack in roasting pan. Pour water into pan. Add peppercorns, cloves, allspice and bay leaf. Tent ham with foil and place in oven. Meanwhile, in food processor, pulse gingersnaps until fine crumbs form. Strain jam through coarse sieve (to remove large chunks). In small bowl, stir together jam and mustard. Brush jam mixture on ham, and then with your hands, pat gingersnap crumbs into jam. Return to oven (leaving liquid in pan) and bake, uncovered, for 30 to 45 minutes, until crumb coating is browned and instant-read thermometer registers 140°F. Let stand for 15 minutes before slicing.